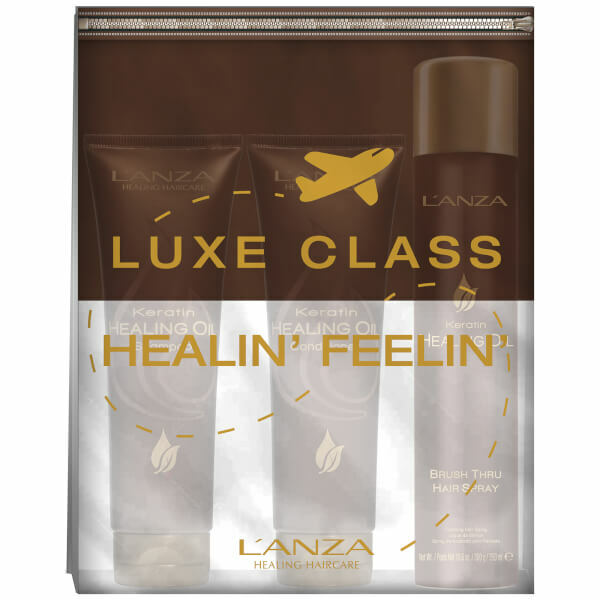 L'Anza's Healing Oil Mini Gift Set is the perfect treat for those craving luxuriously soft and replenished hair, wherever they go. The shampoo and conditioner work in unison with the hairspray to leave locks feeling restored, resilient and radiant. Perfect for the gym and travelling, the set is complete with a complimentary travel pouch. An ultra-luxurious shampoo that replenishes and restores hair to leave it full of body and bounce. Delivering vital Keratin Protein, the shampoo expertly restores the look of volume; it reconstructs the inner layers of hair to promote noticeably fuller and healthier tresses. Utilises a Phyto IV Complex to rehydrate hair. Expect soft and silky smooth tresses. This replenishing conditioner delivers ultra-luxurious, restorative properties to help improves hair's volume and strength. Infusing every strand with vital Keratin Protein, the formula contributes to the reconstruction of inner layers of hair to promote body and bounce. Utilises a Phyto IV Complex to rehydrate hair. A natural hold hairspray that leaves hair touchable and flexible without compromising style memory. The medium hold hairspray is lightweight and provides mirror-reflecting shine while adding dimension and bounce to tresses. Formulated with a hydrating Phyto IV Complex, the styling spray allows for continuous brushing without snagging, and provides flexible hold without build-up or flakiness. Residue-free. Shampoo: Apply to damp hair, lather & Rinse. Follow with Keratin Healing Oil Conditioner. Conditioner: After shampooing with Keratin Healing Oil Shampoo, apply generously. Rinse thoroughly. Hairspray: Hold 6-8 inches from hair, spray, comb or brush. Then spray onto finished hair for the desired result. Shampoo: Water/Eau (Aqua), Sodium Cocoyl Isethionate, Cocamidopropyl Betaine, Acrylates/Vinyl Neodecanoate Crosspolymer, Cocamide MIPA, Cetrimonium Chloride, Fragrance (Parfum), Polyquaternium-22, Keratin Amino Acids, Crambe Abyssinica Seed Oil, Orbignya Speciosa Kernel Oil, Euterpe Oleracea Fruit Oil, Coffea Arabica (Coffee) Seed Oil, Astrocaryum Murumuru Seed Butter, Entada Phaseoloides Bark/Seed Extract, Cereus Grandiflorus (Cactus) Flower Extract, Ceramide 2, Dimethiconol Meadowfoamate, Sodium PCA, Magnesium PCA, Zinc PCA, Manganese PCA, Mica, Titanium Dioxide, Glycol Distearate, Laureth-4, Stearyl Alcohol, Myristic Acid, Silicone Quaternium-3, Trideceth-12, PEG-150 Distearate, Propylene Glycol, Guar Hydroxypropyltrimonium Chloride, Acrylamidopropyltrimonium Chloride/Acrylamide Copolymer, Sodium Benzotriazolyl Butylphenol Sulfonate, Buteth-3, Tributyl Citrate, Tris(Tetramethylhydroxypiperidinol) Citrate, BHT, Methylchloroisothiazolinone Methylisothiazolinone, Linalool, Benzyl Salicylate, Coumarin, Hexyl Cinnamal, Limonene. May Contain: Sodium Hydroxide & Citric Acid. Conditioner: Water/Eau (Aqua), Cetearyl Alcohol, Glycol Distearate, Cyclopentasiloxane, Behentrimonium Methosulfate, Glycerin, Silicone Quaternium-3, Steartrimonium Chloride, Dimethicone PEG-8 Benzoate, Keratin Amino Acids, Crambe Abyssinica Seed Oil, Orbignya Speciosa Kernel Oil, Euterpe Oleracea Fruit Oil, Coffea Arabica (Coffee) Seed Oil, Astrocaryum Murumuru Seed Butter, Ceramide 2, Cereus Grandiflorus (Cactus) Flower Extract, Dimethiconol Meadowfoamate, Sodium PCA, Magnesium PCA, Zinc PCA, Manganese PCA, Dimethicone, Polyether-1, Trideceth-12, BHT, Tris(Tetramethylhydroxypiperidinol) Citrate, Caprylhydroxamic Acid, Phenoxyethanol, Methylpropanediol, Sodium Benzotriazolyl Butylphenol Sulfonate, Buteth-3, Tributyl Citrate, Propoxytetramethyl Piperidinyl Dimethicone, Cetrimonium Chloride, Cetrimonium Bromide, Trideceth-6, C11-15 Pareth-7, Urea, Saccharide Hydrolysate, Magnesium Aspartate, Glycine, Alanine, Creatine, Propylene Glycol, Fragrance (Parfum), Linalool, Benzyl Salicylate, Coumarin, Hexyl Cinnamal, Limonene, Mica (CI 77019), Titanium Dioxide (CI 77891).